Samsung Galaxy Music Duos GT-S6012 is the new dual SIM smart phone from Samsung which includes music-centric phones category. 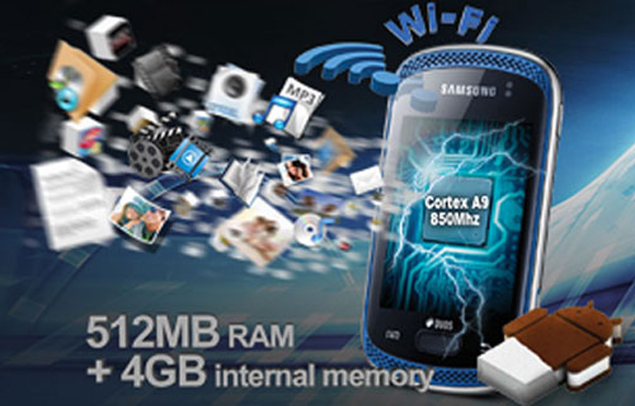 The smart phone expands the popular and successful Galaxy smart phone world of Samsung. Samsung Galaxy Music is another smart phone comes with the same specifications. The main different between these two smart phones is the SIM connectivity. Samsung Galaxy Music has single SIM connectivity. Samsung Galaxy Music Duos has a brilliant 3 inches TFT Capacitive touch screen with 320 x 240 pixels QVGA display. The smart phone comes with Google Android 4.0 Ice Cream Sandwich operating system and advanced connectivity options like 3G and Wi-Fi. Samsung Galaxy Music Duos runs with single core A9 850 MHz processor. The 3G dual SIM android smart phone has 512 MB RAM and 4 GB internal storage memory. There is a memory slot on the device that supports micro SD cards up to 32 GB. The smart phone has 3 mega pixels rear camera with fixed focus. There is no LED flash and front camera. Samsung Galaxy Music Duos is powered by a standard 1300 mAh, Lion battery which provides sufficient talk time and standby time. Stereo FM radio with RDS, FM antenna and FM recording are the Radio features of the handset. It is really nice for me to see you and your great hardwork again.Every piece of your work look excellent.Looking forward to learing more from you!